One of my goals for Vegan MoFo this year is to work through the absolutely 350% redonculously long list of bookmarked recipes. In between my RSS feed and bookmarks, I have too many recipes to count and, hey, what’s the point of saving them if you never make them? Today’s recipe is really a version of an idea, an age-old idea, really. 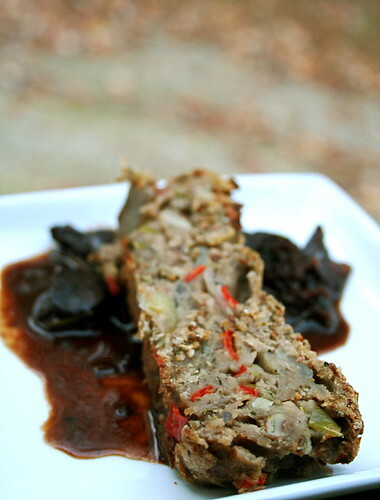 Vegan meatloaf. Neatloaf. Vegloaf. Whatever you call it, it seems like everyone’s got a version. Over the past year or so I’ve bookmarked a few, Jenna of Eat, Live, Run‘s recipe for Vegan Lentil Walnut Loaf, Renae of i eat food’s riff on VeganDad’s meatloaf, and Chow Vegan’s Home-style Vegan Meatloaf, just to name a few. And for over a year now, since a friend and I got a hankering for meatloaf sandwiches, I’ve been meaning to make one–and isn’t fall just the right season for it? Well, two weeks ago at work, my co-worker cooked up a beautiful bison meatloaf with a garlic red wine sauce and I knew, beyond a shadow of a doubt, that I had to get on this soon. So I did. Finally. And without putting it off and putting it off and putting it off. (Good god, how I wish I had time to really cook for myself these days.) But we all know that I love a challenge, too, and that veganizing and gluten-free-izing anything is so much more fun than just the normal recipe. G’s experimenting with going gluten-free too, so gluten-free vegan meatloaf, why not? I’m really happy with the version that I came up with. The loaf is tender and full of vegetables, but holds together without wheat gluten. The quinoa flour and the pecans lend a nice nuttiness to it, and the blend of dried herbs made the cabin smell like Thanksgiving. Mmm. Stuffin’. But it’s better than stuffing because it isn’t bready at all, more loafy and veg-centered. Though I do think it would make a nice addition to any Thanksgiving table, while we’re on that topic. I paired the vegloaf with a version of my coworker’s red wine sauce and holy wow does it pair nicely–garlic, rosemary, red wine, balsamic vinegar, more mushrooms: what more could you ask for? Well, maybe a glass of wine and some sauteed kale, but other than that, it’s pretty damn perfect. Preheat the oven to 375 Fahrenheit. Line a loaf pan with aluminum foil. In a saute pan over medium heat, warm 1-2 tbsp olive oil. Add onions, cook for 3-4 minutes, until translucent. Add peppers and garlic, cook for 4-5 minutes. Add shitake mushrooms, cook for 4-5 minutes, until they begin to soften. Add basil, oregano, aleppo pepper, thyme, salt, and black pepper. Cook for 1-2 minutes, until fragrant. Remove from heat. In a mixing bowl, crush the beans with a fork. Add the sauted vegetables, pecans, and Bragg’s Amino Acids. Mix to combine. Add the quinoa flour, potato starch, and xanthum gum, and mix until a doughy ball forms. Transfer the mixture to the loaf pan and pat it down until smooth on top. Bake for 45 minutes, until the top is golden brown and an inserted knife comes out clean. Let cool on a wire rack for 10 minutes, then remove loaf from pan. Let cool another 10-15 minutes before slicing and serving. In a small sauce pan, warm the olive oil on medium heat. Add the shitake mushrooms and sundried tomatoes and cook for 5-7 minutes until soft. Add the garlic and rosemary and cook for 1 minute until fragrant. Add the red wine, water, and balsamic vinegar, and increase the heat to high and bring to a boil. Once boiling, lower to a simmer and let the sauce reduce for 15-20 minutes. Add more water/wine/vinegar as necessary. Once the sauce is reduced, add the Earth Balance and cook for 1-2 more minutes, until the sauce achieves a glassy, rich-looking hue. Remove from heat and serve with the VegLoaf. I tried to make a veggie-lentil loaf once. It tasted good, but it completely fell apart and looked like mush. Yours looks like it held together nicely though. That sauce sounds delicious, I love using red wine in cooking. hot damn, Jes – that’s the sexiest slice o’ neatloaf i’ve seen. garlic wine sauce????!!! !ooooooh, yay! you said 2 other magical words (besides garlic & wine): pecans and shitakes. i’m in. w00t! also, redonculously made me laugh really hard. dan says redonculous all the time and i’ve never heard anyone else use that before. rock on! Wow, that’s one delicious looking vegloaf! I like how it doesn’t have wheat gluten in it. And the garlic red wine sauce is a very nice touch. It makes it much more fancier than ketchup. Bookmarked recipes? Uh, colour me guilty. But I’m going to strike again and bookmark this one, because it looks nommers! I love makng loaf-y foods, and that gravy looks wonderful! Loaf is in the air! The sauce! The loaf itself looks super scrummy, but the sauce has stolen my heart… or my belleh! That looks fabulous. Grrr. another option for Thanksgiving. Well, at least I have choices. Thanks! This looks good – awesome to pack this with veggies and grains instead of the faux meat I’ve used before. Plus, I think I’d like the red wine sauce and my fella could still put ketchup on his. my god! That looks so good! I have to make it.